The Ak-Chin Indian Community has two lease space options. 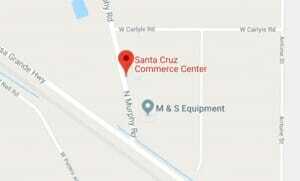 In Santa Cruz Commerce Center, the Mesquite Building is a multi-tenant office/warehouse complex with five individual suites. On the Ak-Chin-owned property adjacent to the Santa Cruz Commerce Center in Pinal County, Adobe Office Suites is an executive suites style building with small individual offices that share common areas like a conference room, kitchen and bathrooms. Both buildings are located just north of Maricopa/Casa Grande Highway between the cities of Maricopa and Casa Grande. They are also less than 5 minutes from the Community’s own general aviation airport, Ak-Chin Regional Airport. The Adobe Office Suites has offices that start for as little as $190/month.